This is the place where using the iPad can really make a difference for lawyers and advocates — and judicial officers too. The important thing is that the iPad has to help not hinder the advocate. I confess that there are some things that an iPad or computer doesn't do quite as well as paper: for example, having a brief open and at the same time having a notebook open while you take notes; or photocopying a page. But so long as you understand its limitations and benefits, it can be extremely helpful in the court. I mentioned in 2.1.1 GoodReader that I use GoodReader as my main file viewer. This was my default opening page: the ‘root’ level. I place current briefs at this level, along with any other documents I might need regular access to for the current case. I can create new folders using the ‘Manage Files’ tab. In the Legislation folder, I store all the legislation I need, including different point-in-time versions. See 4.2 Legislation for where to get it. We‘re fortunate in Australia, and Victoria particularly, to have free access to a lot of basic but high-quality legal information. For most lawyers — and particularly advocates in the criminal field — legislation is the major source of primary law. 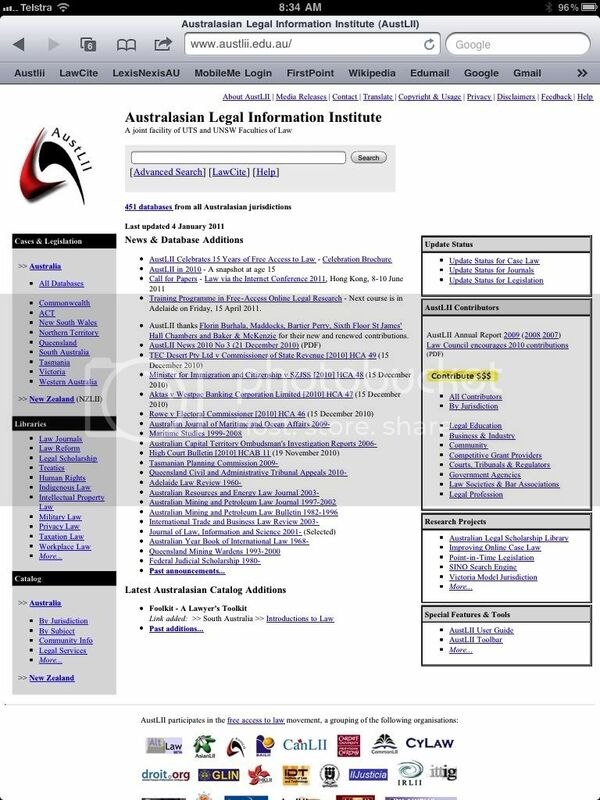 Although Austlii (see below) contains legislation libraries, I don’t recommend them for use in legal practice: although they’re now regularly updated, they’re marked up automatically and occasionally, there are errors. Bit embarrassing if we get our law wrong! The place to get Victorian legislation is the Victorian Legislation and Parliamentary Documents Website. (You may occasionally see it referred to as ‘LDMS’, an acronym for Legislative Document Management System. That was the catchy title for the online database when it was first available only on the Victorian government intranet.) This website is run by the OCPC (Office of Chief Parliamentary Counsel). You can get historical as well as current versions of legislation, and bills and explanatory memorandum. A perfect example of why you should prefer the versions available here in preference to Austlii is the new Part V of the Interpretation of Legislation Act 1984, which is not presently available on Austlii. This new Part commenced operation on 1 January 2011, and provides for authorised electronic versions of legislation, authenticated by digital certificates that can be created under Adobe Acrobat. Act is defined in section 38. Statutory rule is defined in section 38. Victorian Legislation Website means www.legislation.vic.gov.au. This Part is in addition to, and does not derogate from, section 54. (1) The Chief Parliamentary Counsel may authorise an electronic version. 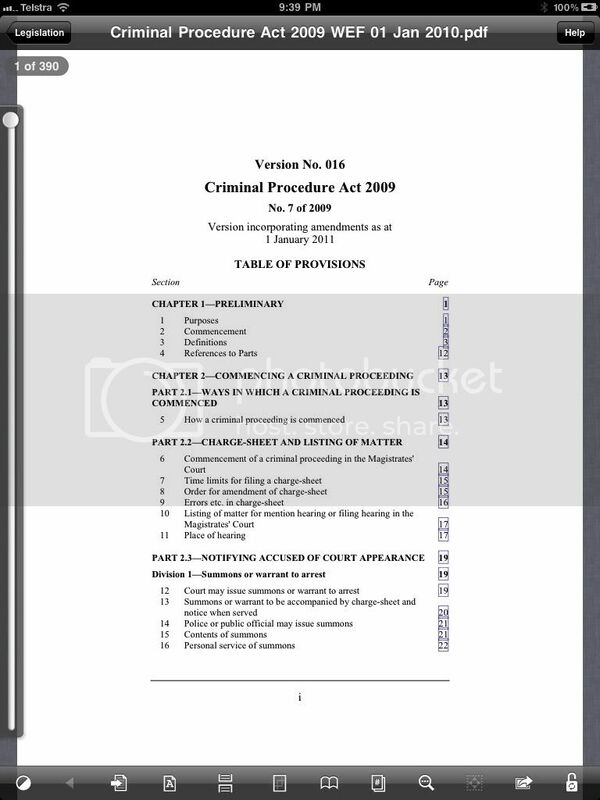 (c) the words “Authorised by the Chief Parliamentary Counsel” appear at the foot of each page of the version. (3) An electronic version which does not comply with subsection (2) is not an authorised electronic version. A printed copy of an authorised electronic version is an authorised version only if it is printed directly from the authorised electronic version. 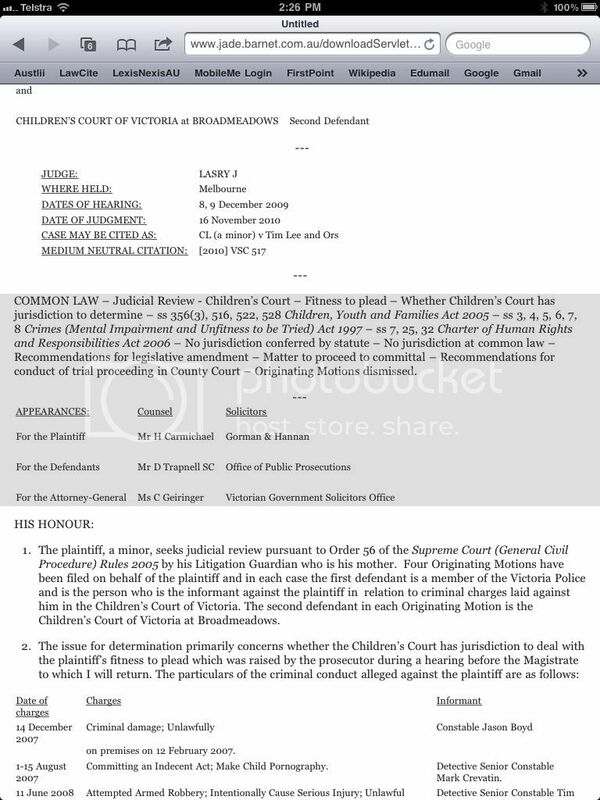 (1) An authorised version is on the mere production of that authorised version admissible as evidence thereof before all courts and persons acting judicially within Victoria. (2) It is presumed, unless the contrary is proved, that a document purporting to be an authorised version is what it purports to be. Document is defined in section 38. This Part was inserted by s 28 of the Justice Legislation Further Amendment Act 2010. Right now, the OCPC has decided not to bookmark the authorised electronic versions of legislation, but will provide unauthorised electronic versions that do have bookmarks. 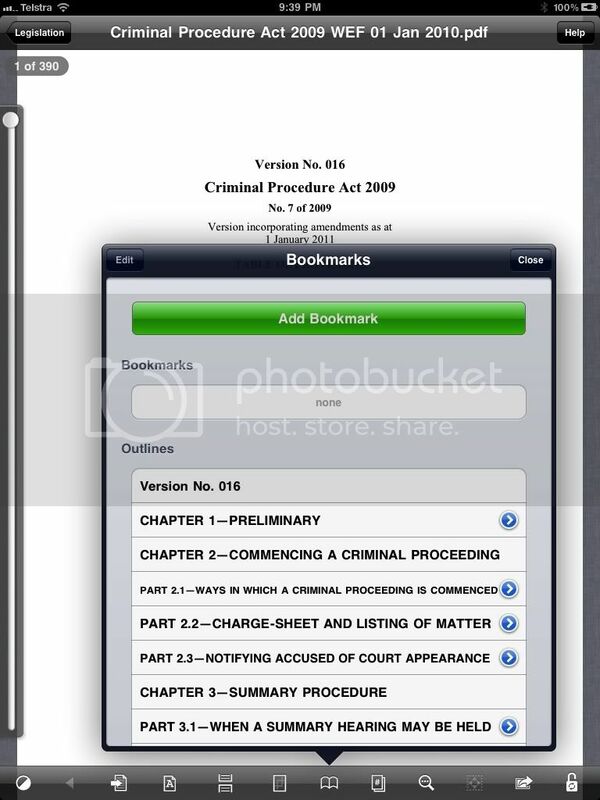 I guess that’s because it reckons the main use for the authorised version will be to print hardcopy for use in court. But if you’re reading this, it means you’re interested in using legislation electronically on an iPad! It really would be helpful if we could refer to and hand up the authorised legislation and navigate the document. That provides two ways of jumping around the document. The first is from the table of contents, where the hyperlinks are highlighted in blue. Tapping on one will take you to the corresponding page. Where there’s an arrow pointing to the right, you can tap on that to drill down another level in the bookmarks to a lower level in the contents hierarchy, such as Division or Section. 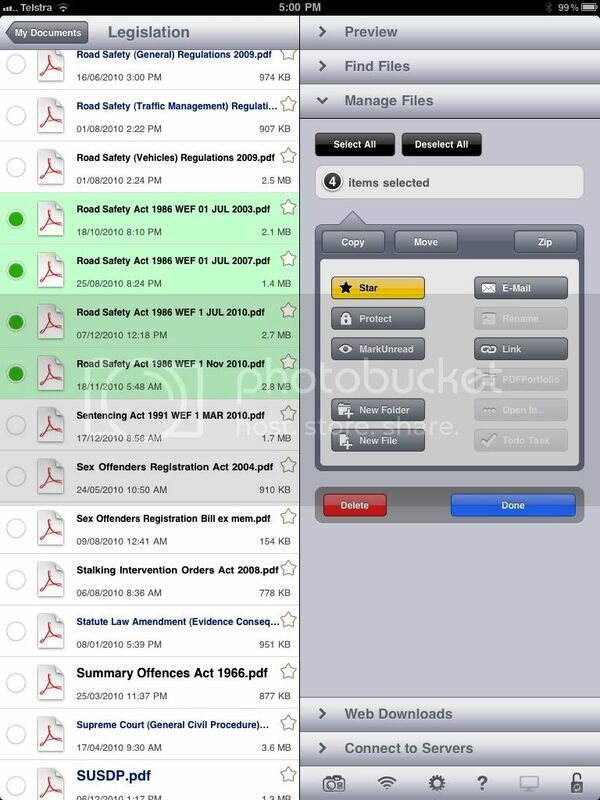 I also mentioned before that I download legislation into my DropBox, so I keep a copy of my commonly used legislation there and can access that through GoodReader, rather than having to navigate the Victorian Legislation site. I’ve already had a few occasions where I was able to download legislation I needed but didn’t have with me, and then hand it up to the bench. One time we were discussing the application of the Appeal Costs Act 1998, which I didn’t have with me. So, I simply downloaded it, quoted the relevant provision, and then handed it up. After having the opportunity to read what the Act actually said, as opposed to mere submissions, the Bench agreed with me, and then finished with, “Thank you; you can have your…er…device back!” I expect this will become less of a novelty in the future! Commonwealth legislation is available from www.comlaw.gov.au. It offers a variety of Commonwealth Acts and Legislative Instruments, including point-in-time versions. Unlike Victorian electronic legislation, Commonwealth electronic versions don’t contain hyperlinks, which makes it hard to navigate. The Criminal Code 1995 for example, is a nightmare to scroll through. With Adobe Acrobat I can insert hyperlinks, but it’s painstaking. 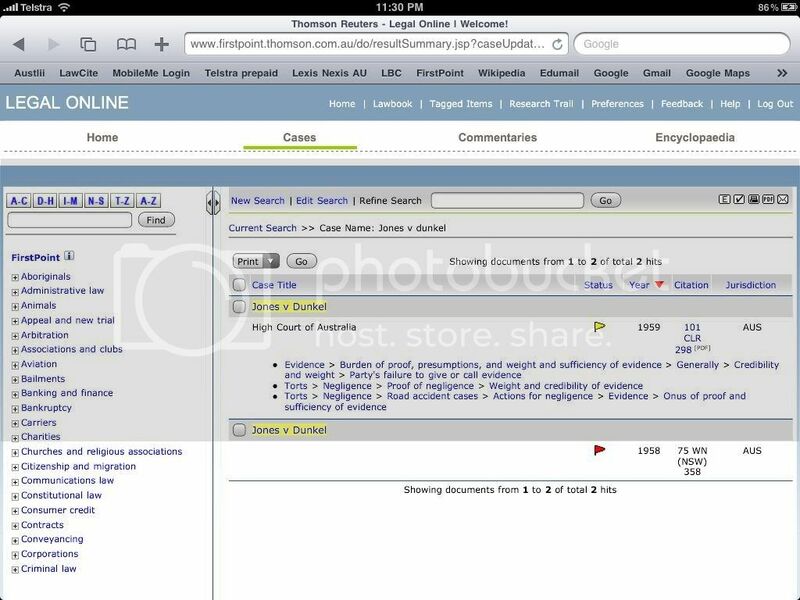 Austlii is an excellent resource for cases, and has a very useful free citator, LawCite. It‘s part of a group of free access providers to legal information. Other useful equivalents are WordLii, BaiLii (British and Irish law) and CanLii (Canadian Law). 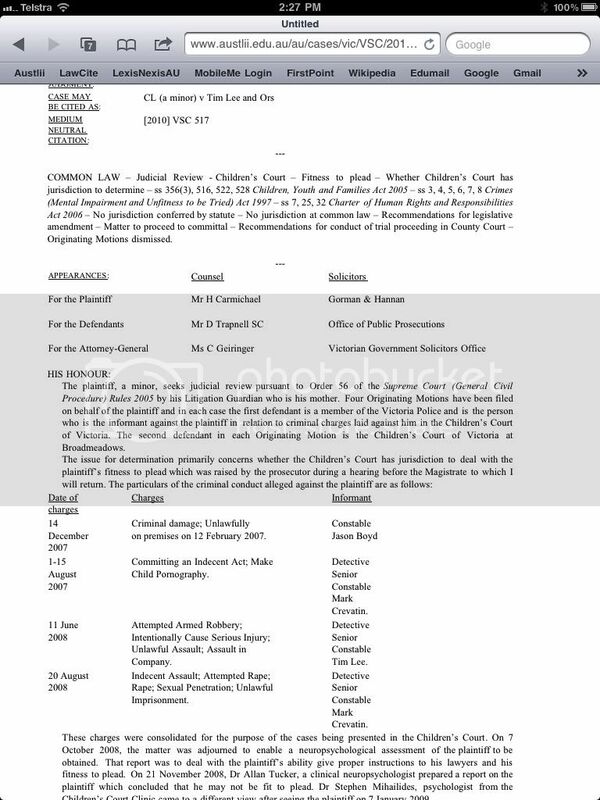 The advent of Austlii means that many cases are now available only in a media neutral format, though reported and authorised versions are still preferred when available: Practice Note 1 of 2006 (2006) 14 VR 529. Austlii is also lightening fast, because it’s a text-only website. Its case coverage extends back about 10 years or so, depending on the jurisdiction and court, but has a few gems. For example, the High Court’s judgments back to 1903 are all available on Austlii! Although they‘re not in the same format as the CLRs, and sometimes don‘t have the headnote or catchwords, this is still a phenomenal resource. An alternative to Austlii is Jade BarNet, which is also free. I mentioned this great legal research tool in April last year. But…there’s no ability to save this locally on the iPad. It’s visible in the browser, but that’s it. 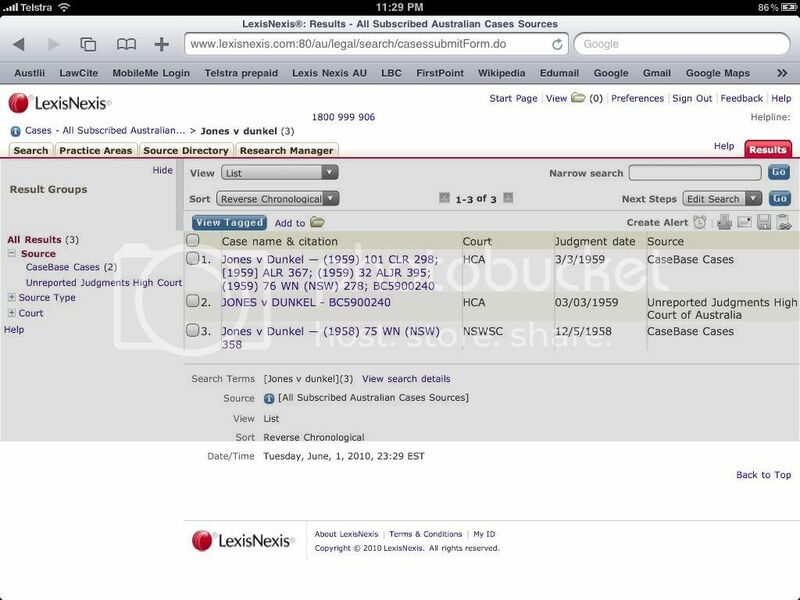 If you have a subscription, the iPad works quite well with Lexis Nexis AU. I discussed this in July. The only real problem I found with it on the iPad was that downloading PDFs resulted only in a single-page document. This is still a problem. I also discussed Thomson/Law Book Co‘s First Point in July. 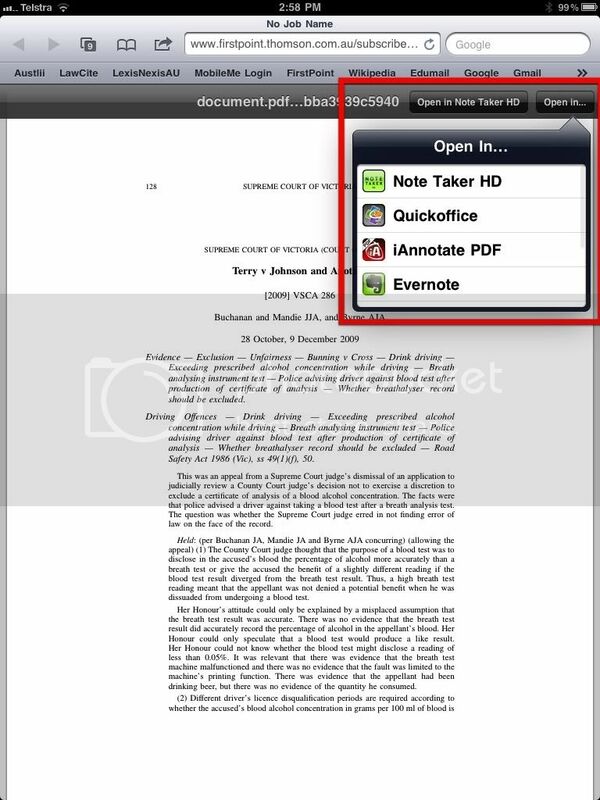 Using First Point, PDF copies of cases still download quite nicely on the iPad, and are now even easier to save on to the iPad: simply tap the centre of the screen, and a menu bar pops up with a button to open the document in NoteTaker HD, or another button to open it in any other application. 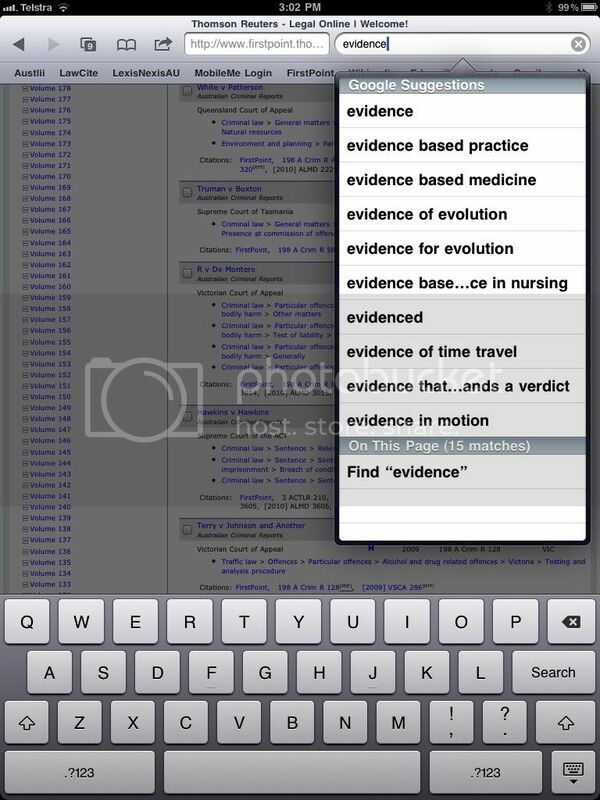 The latest version of iOS now has the ability to search webpages in Safari. Simply enter a word or phrase you’re looking for in the google search panel at the top right, and at the bottom you can see results for that word or phrase on the current page. Tap to jump to the results. I haven’t made much use of this inside court yet, and I’m not entirely certain how well it might be received. With Google Maps it’s possible to bring up maps and satellite images of relevant locations, and ask witnesses to authenticate the image and refer to it in their evidence. I’ve done it with hard-copy printouts, so I guess it’s possible to do with an electronic version. There might be concern about retaining a copy for the court record: I guess the solution is to take a screen shot. Do this by pushing the power button and home button together. Screen shots are accessible in the iPhoto app, and can be opened in other applications, just like with opening PDFs from 4.3.4 First Point, above. The other thing we can do with Google Maps is to create and save a map with points of interest. This is one I prepared for a case earlier in the year, but didn’t get a chance to use. 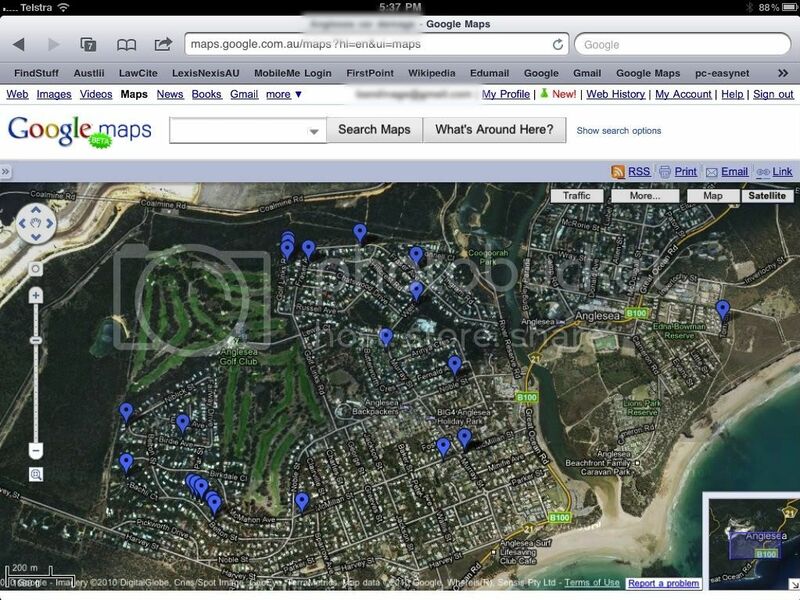 It plots various locations in Anglesea relevant to the case. This shows locations relative to each other, allows the user to zoom in and out, and tapping a location brings up a window with a street view thumbnail, and an option to zoom in or switch to street view. Although this sounds great, in practice it seems a bit slow to be useful enough in a court room. 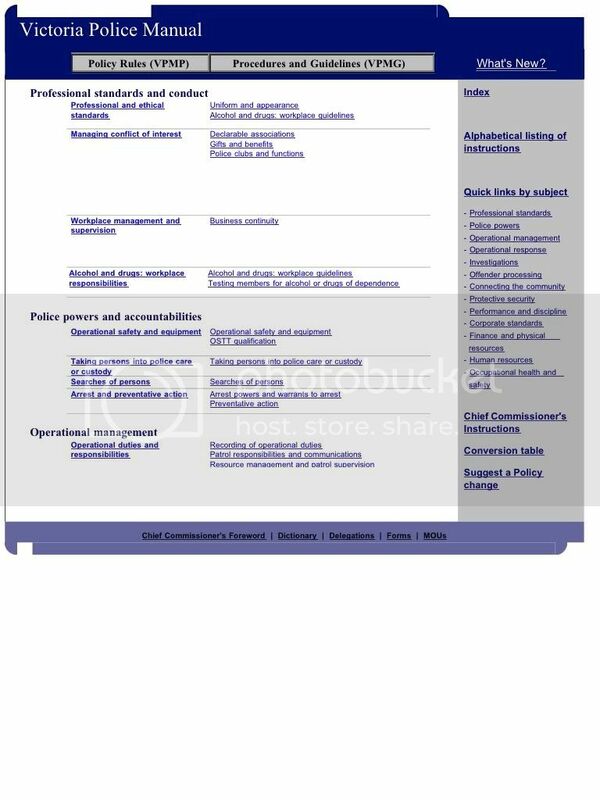 Victoria Police sells the Victoria Police Manual on CD-ROM for $180 per year, through its Corporate Policy Unit. When opening different instructions, I find they don’t scroll, so I open the print-friendly PDF version. 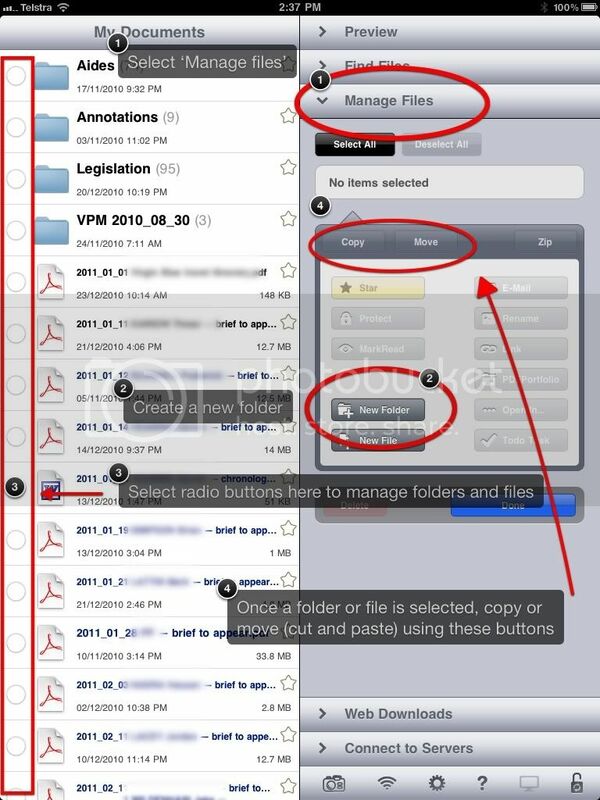 That can also be annotated or opened in other apps. Next: some other iPad uses for lawyers and advocates, and a brief discussion of some accessories for the iPad. Einstein did not commit to memory anything he could look up. The list is getting shorter.